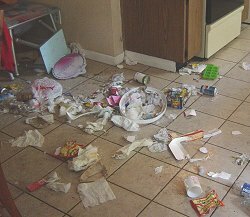 Since All American's Dog Training is done in your home, it enables us to get to the root of most of your dog's behavioral problems. We have found that most problems are legitimate survival skills on the dog's part, acted out in inappropriate environments. Correcting the dog for an incorrect behavior is a great place to start, but you need to be able to redirect the dog to do an activity for which you may praise your dog.